Jon Hamm attends the premiere of ‘Million Dollar Arm’ at the El Capitan Theatre on May 6, 2014, in Hollywood, California. AMC’s “Mad Men” comes to an end Sunday, wrapping up seven critically acclaimed seasons that scooped up Emmy nominations left and right. We’ve spent years with this cast, so what will they do now? Some cast members — particularly Jon Hamm, January Jones and John Slattery — appeared on the big screen after the show took off, and no doubt will continue to do so. But some will probably never be seen again, and others will eke out solid careers, working on and off. Even a long run on a great show is no guarantee of a lot — or, for that matter, any — work following its conclusion. So what does an actor typically do after a run on prestige TV like “Mad Men”? There’s pretty varied data we can look to for answers. After “The Sopranos,” cable networks started making a lot of good TV. And a lot of those shows relied on large ensemble casts, which means that we have a lot of people from a lot of shows to see how careers pan out. 1 point for each season they regularly appeared on another TV show. 1 point for each time they had a leading role in a film. 0.25 points for each supporting role in a film. Let’s get a sense of the baseline. (I’ve posted my data on GitHub if you want to take a look.) The median actor in our set had a score of 2.3 More than 1 in 5 of the actors in our set never had a major role in TV or film again, and about a third of the actors had a score of less than 1, meaning that they never had more than a few supporting roles in films. We should also look at this score annualized — we don’t want to overemphasize performers who have been on the market longer. After doing that, we see the median performer in our set had a score of 0.5 points per year, which generally breaks down to a television season or a lead role in a film every two years. First off, it’s worth looking at the people who are seen multiple times in our set — the folks who appeared on more than one prestige television show. Anna Gunn first appeared on “Deadwood” but then catapulted to a leading role on “Breaking Bad.” Michael C. Hall was first on the show “Six Feet Under,” a role that got him a job as a fellow who puts people six feet under on “Dexter.” Both of these people are pretty good candidates for best career after a stint on prestige television. When we look at the actors who have done the best on a per-year basis, the top tier is dominated by people who just wrapped up a show and were really busy in the past year or so: Michelle Monaghan of “True Detective,” Ryan Kwanten of “True Blood” and Siobhan Finneran of “Downton Abbey” do the best. But having one good year doesn’t mean they are the best across the board, right? If anything, this leads me to believe that people tend to get work right when a buzzed-about show ends or right after they leave one. 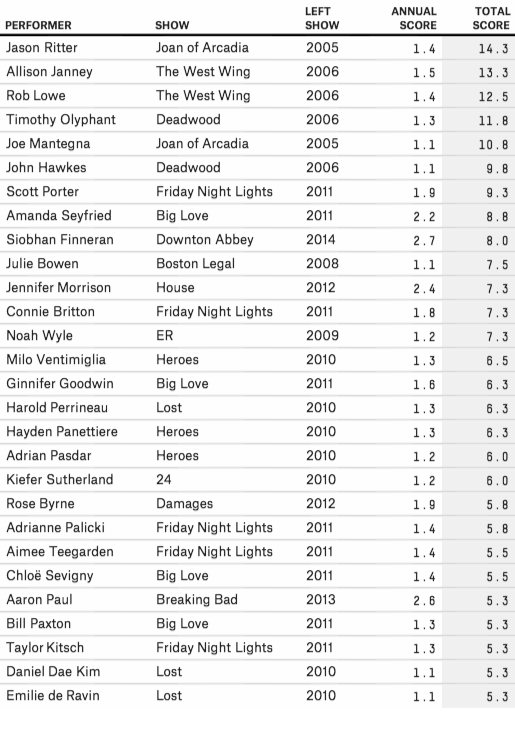 By the raw metric — simply counting up points to see who has accumulated the most — the folks with the most productive post-show careers are Jason Ritter of “Joan of Arcadia” and Allison Janney and Rob Lowe of “The West Wing.” This, interestingly, gives us the opposite problem: People with more time do stuff. But since these are actors from older shows with large casts — “Deadwood,” “Joan of Arcadia,” and “The West Wing” — coming out big, this is probably good news for the long-term prospects of the “Mad Men” ensemble. I personally think the best way to crown a winner is some combination of the two metrics. People who rank highly on both metrics — a track record of work over a long period and a high productivity rate — are the most successful of the bunch. That group includes performers like Jennifer Morrison of “House,” Amanda Seyfried of “Big Love,” and Scott Porter and Connie Britton of “Friday Night Lights.” All four have stayed really busy. My answer, then, to who’s had the best post-prestige-TV career is probably Seyfried. After being launched to stardom on “Big Love,” she’s had major roles in an Oscar-nominated drama (“Les Miserables”), a comedy (“A Million Ways to Die in the West”), romantic movies (“Dear John”) and biopics (“Lovelace”). So who’s the Amanda Seyfried of “Mad Men”? Once I get over the show finally ending, I’m really excited to find out. Unfortunately, this isn’t a totally perfect line. It leaves out shows like “The Wire,” which was never nominated for an Emmy, and “American Horror Story,” which has competed only in the miniseries category. It also includes shows like “24” and “CSI: Crime Scene Investigation,” which I personally don’t consider prestige television. But that’s the problem with trying to draw a line in the sand. In an ideal world, I would define our set as “shows the A.V. Club really liked all the time.” But you can’t replicate that methodology, so I had to work with what I had. Equivalent to appearing on two seasons of TV or snagging two leading roles in movies or eight supporting character roles in films.